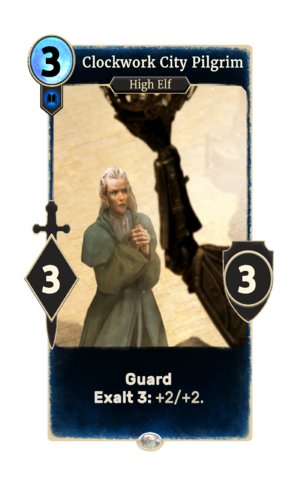 Clockwork City Pilgrim is a common Intelligence creature card. It is part of the Houses of Morrowind expansion. "I seek Sotha Sil's knowledge." "We shall help him reshape the world!" "For the Father of Mysteries." This card's exalt ability applies the Traveler card effect. This page was last modified on 14 February 2019, at 00:34.